In this tutorial, we will learn how to work with particles in Blender to create cool looking effects! If you’ve watched some 3D animated flicks, you may have wondered how they create fireworks, rain, glowing orbs, dust particles or even hair/fur. The secret all lies in particles! In Blender, we use the in-built particle system to re-create these effects. So let’s take a look at how to use this system! 1) Delete everything and leave the cube. Select the cube. 2) Select the Particles tab in the Properties window. 3) Press the ‘New’ button to create a new particle system for the cube. Now playback your animation (Alt+A) and you should see that your box is now emitting particles. Your cube should sort of act like the nozzle of a shower head. 4) This is made possible by the bunch of default settings that have been automatically set up for you when you created a new particle system. Play around with these settings to make the particles do weird stuff. 5) A few things. The Emission bit of the settings are used to control how many particles you want, the start time for when the particles for when the particles should appear and the end time for when they should go away. The Physics bit controls how the particles move and their sizes and other physical related stuff. The Cache is used to store your final particle animation either in a separate file or within the blend file. This is good to do after you are happy with the final animation of the particles since when you want to render or preview later on, it would not have to re-calculate the animation. 6) If you don’t want gravity to affect it’s movement, you can switch off the gravity completely. 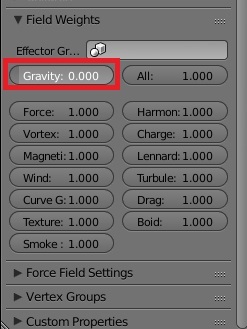 Either go to the scene tab and change the Gravity Z-setting from -9.81 to 0. This will affect the gravity of your whole scene. So if any object relies on gravity, they too will be affected. Another (better) way is to turn off the gravity for just the emitting cube. In the Particle tabs, you will see a section called Field Weights. Here, slide the gravity to 0. 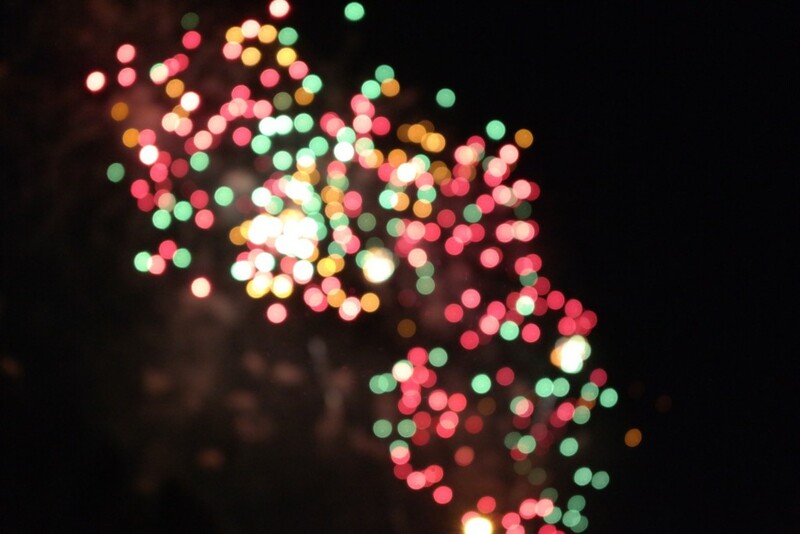 By playing around with these settings, you will be able to simulate fireworks or rain or even floating dust particles. 1) Change the type from ‘Emitter’ to ‘Hair’ in the Particle settings, you would notice your particle system now becomes your hair system. 2) Play with the settings for a bit. Similar to the emitter, changing the emission number will change how many strands of hair your mesh will have. That is, bumping up the emission number to 2000 will give your cube 2000 hair strands. 3) Let’s comb that hair! At the moment, it looks like the cube has suffered an electric shock or something. So we should comb that hair back into place. 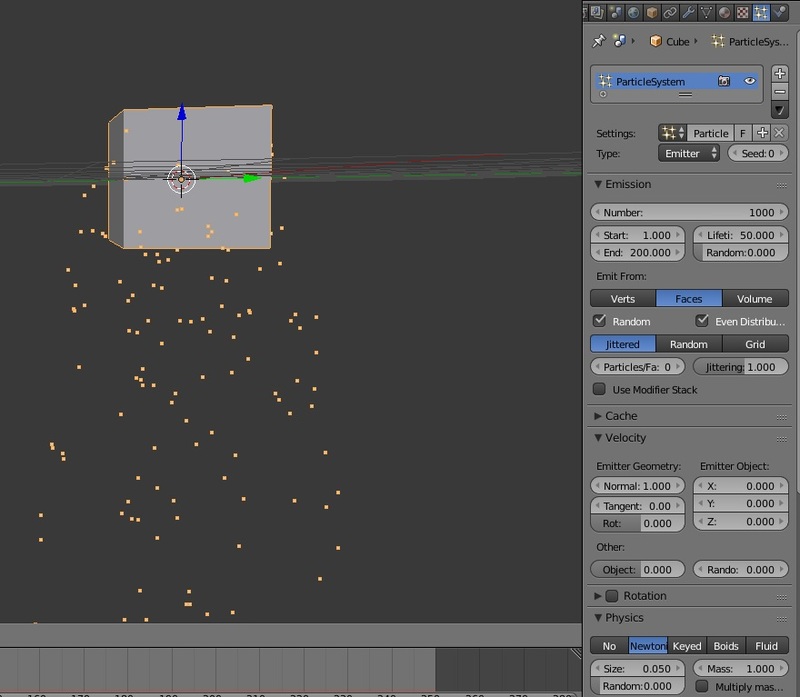 In the 3D view, switch from Object Mode to Particle Edit. 4) Just like sculpting, you will see a bunch of brush options in the toolbar on the left (press T to open if you don’t see it). Select the Comb brush. 5) You are now the barber! 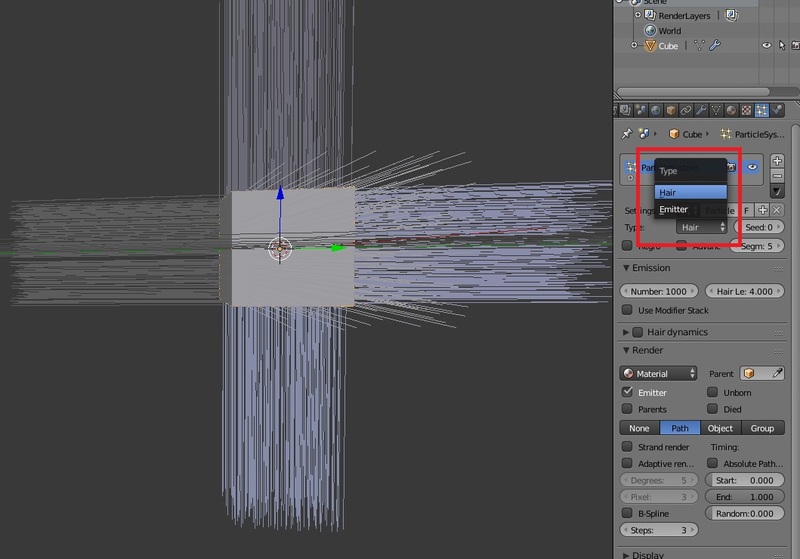 Go to your mesh and left-click drag to start combing. Go crazy and comb that unruly hair to any shape you want. 6) You might find that your mesh has WAY too much hair everywhere and it probably needs trimming. Well, you are the barber here and you have full control over how you want your hair to look. Select the Cut brush and cut away at the hairs you don’t want. If you want to trim hair and not cut it off completely, make sure you cut along the outer edges. 7) Just a final thing that might help beginners as this part might confuse. This applies to those using older versions of Blender. If you want to give your hair a shader, go to the Particle Settings, under Render choose Material: 2. Now in the material settings, create a new material under the already existing material ‘Material’. This new material will be the hair’s material. Why? When you selected Material: 2, you actually mean the second material of the mesh. 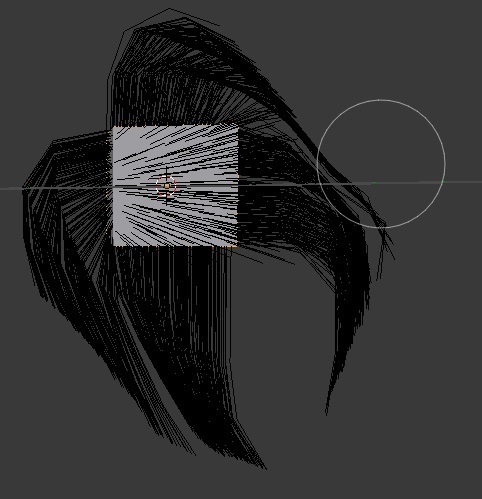 So if you had like 5 materials for your mesh in total, and you selected ‘Material: 4’ in the particle settings, the hair will render with the 4th material in the slot. 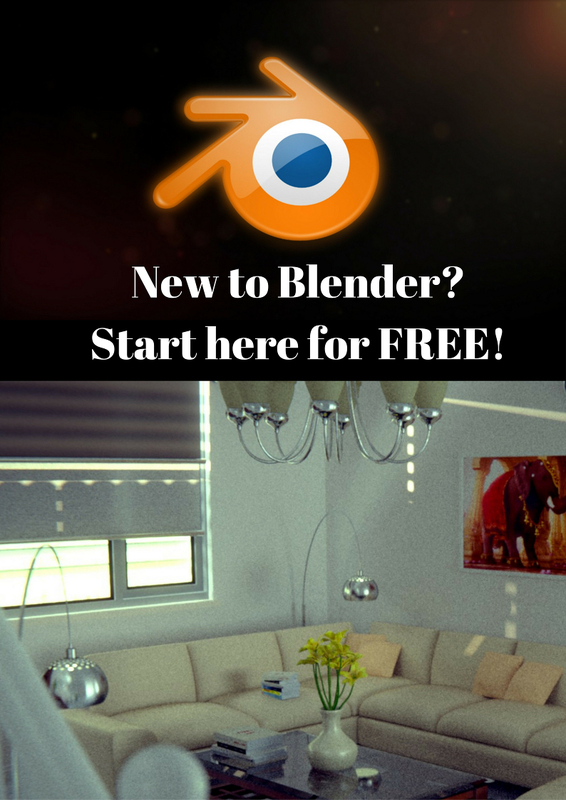 A little confusing but that is currently how Blender works. In the future, this might change and this post might become redundant, but for now it is just the way it is. 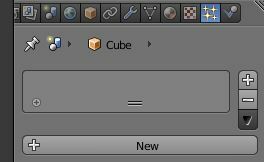 If you are using a new version of Blender (mine is around Blender 2.76), you will still need to create a new material under the existing ‘Material’. 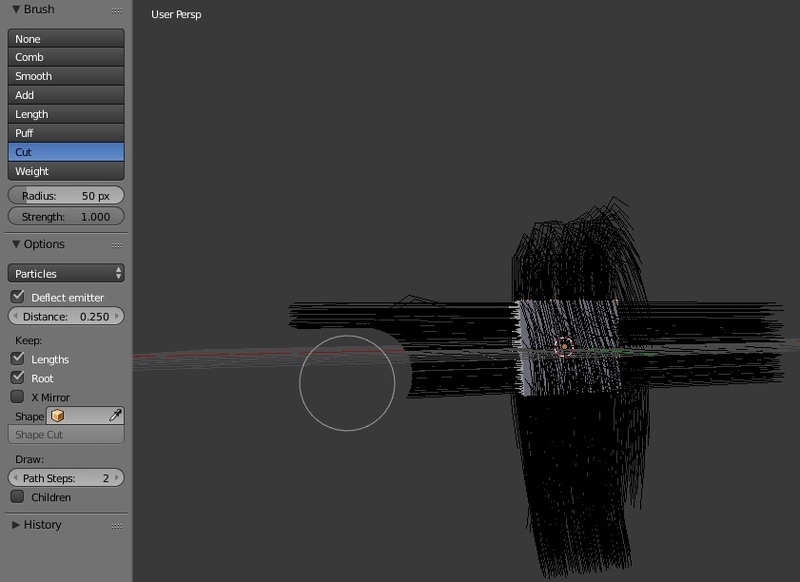 Then in the Particle settings, under Render, change the material from the dropdown directly! Easy as that! I have to mention that the hair system is not ONLY used to make hair and fur. 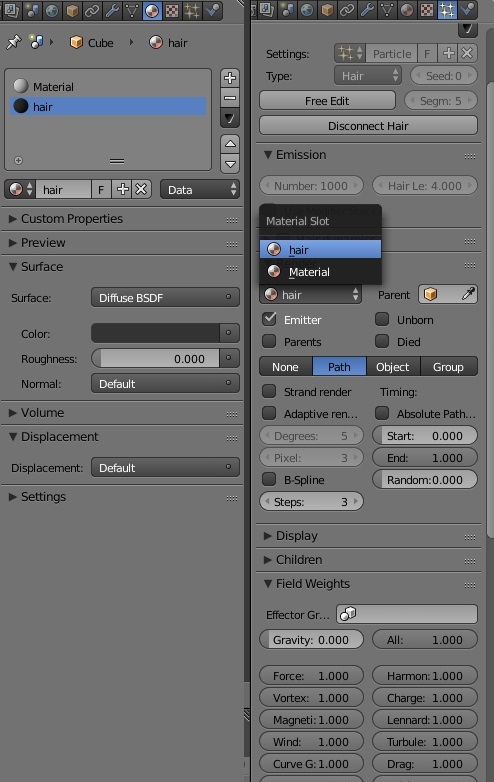 You can replace those hair strands with 3D models (which is done by going to the Particle Settings -> Render -> Change to Object -> Select your object). This means you aren’t just limited to hair but you can create forests of trees, cities, crowds of people, flock of birds, you name it. 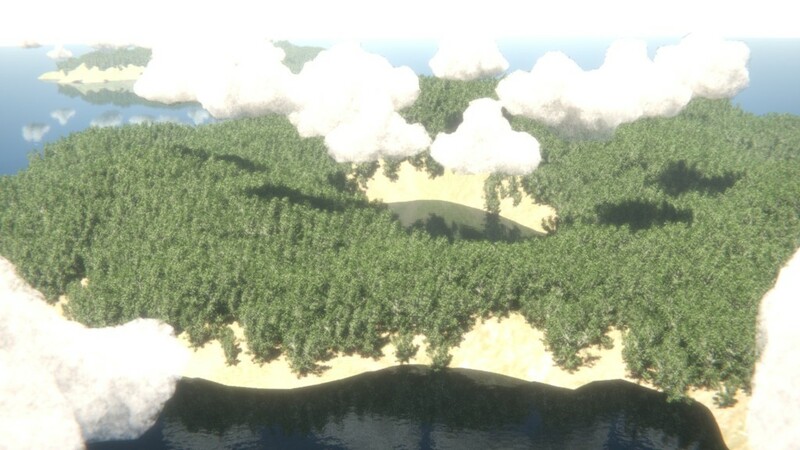 The particle system saves a lot of memory so rendering 1000s of trees will not break your PC compared to you duplicating a tree 1000s of times and rendering that. The image below was created by me where I used tree models to represent hair strands! And that’s all! 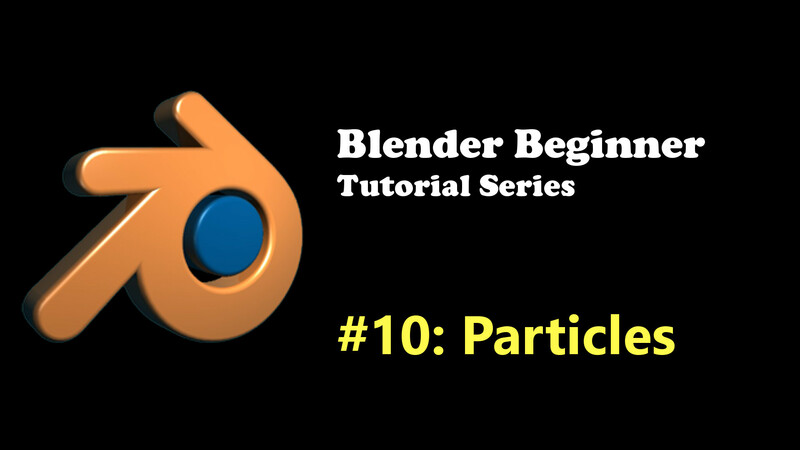 Hopefully, you’ve learned about working with particles in Blender!